Spin it Grand™ offers constant excitement and entertainment to players through the trending Hold ‘n’ Spin Feature and innovative jackpot mechanics. 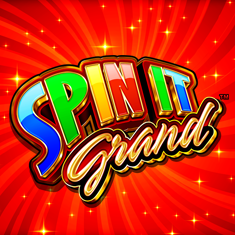 Spin it Grand launched with two titles, Fabulous Riches™ and World of Riches™. The Spin it Grand range depicts a new way to look at the ‘wheel’ mechanic. The new wheel mechanic delivers credit prizes, growing credit prizes and jackpots during the Hold ‘n’ Spin Feature. The games have three levels of standalone progressives and can be seen on the Arc Single™, Helix™ and Viridian Widescreen™ cabinets.